The Nubian Monuments from Abu Simbel to Philae cover a string of ancient archaeological sites in southern Egypt. They were built by various pharaohs from the 2nd millennium BC onwards in their attempt to gain or retain dominance over the Nubian kingdom and its natural assets such as gold, copper and ivory. In the 1960s, the two masterpieces of this set (the temples of Abu Simbel and the sanctuary at Philae) were moved in their entirety to a nearby location due to the creation of the Aswan High Dam and Lake Nasser. The Nubian Monuments from Abu Simbel to Philae comprise 10 archaeological sites in the far south of Egypt. They were the products of the pharaonic attempts to dominate Nubia. Many trip reports from the past about Abu Simbel start with the compulsory convoy that has to be taken to travel there from Aswan, effectively limiting arrival times to two times a day. The convoy has been discontinued however since October 2016. So after leaving my dahabiya near Aswan, I was picked up by a car and driver at 9 a.m. for the 3 hour drive south. The drive is incredibly boring, just a desert road with maybe one or two gas stations. There are road signs however to temples into the desert – two of them are Amada and Wadi es-Sebua which are also part of this WHS . I was staying overnight to be able to visit the temples without tour groups being there, and also to get a hint of the Nubian feel of the town of Abu Simbel. My latter wish was completely satisfied by the Eskaleh Lodge, an oasis of friendliness where hypnotizing Sudanese music was played all day long. At 3 p.m. I was picked up by driver and guide for my scheduled visit to the temples. Somehow the tour company had found it necessary to send a guide, although it isn’t of much use (they are not allowed inside the temples). But well, he bought the tickets and explained the essence of the site to me sitting outside. We just sat at the entrance to the main temple, as no one else was there! The Abu Simbel site covers two temples next to each other. The largest one is to glorify Ramses II – the famous four huge statues at its facade all show himself at various ages! I even can’t think of a modern day dictator who would be so bold. One of the heads has fallen off (already 2000 years ago), but it still is laying at the statue’s feet like a toppled moai at Easter Island. The interior of the temple is well-lit, via a similar method as they use at the Valley of the Kings. As this temple was carved into the rock, not much natural light gets in. I had to forget about the delicate carvings and symbolism of the Ptolemaic sites that I visited earlier: the temple is a brash statement of power of Ramses II, mainly showing his accomplishments on the battlefield. The second temple at Abu Simbel is dedicated to Nefertari, one of the wives of Ramses II who was of Nubian descent. It does show her, and him again. The interior is decorated with remarkable heads representing the goddess Hathor. I finished both temples within an hour – except for the facades with the mega statues and an occasional glance at Lake Nasser there isn’t much that will keep you there longer. I tried to find the “seams” where they pasted the temples together again after the rescue effort in the 1960s. If you look closely they can be seen, but it has been done very well. Only the back side of the rock where they are now located feels manmade. The next morning I got up at 5.20 and walked through the streets of Abu Simbel once more. The temples are especially beautiful at sunrise, as they are illuminated by the sun at that hour. I had read that sunrise tours (even from Aswan) are popular here, but again no more than a handful of other visitors were present. After Abu Simbel, I unfortunately had only one afternoon left in Aswan. So there was little time to check out the other monuments included in this WHS. I decided to focus on Elephantine island, the island just in front of Aswan town center. A very short public ferry ride (costing about 2 minutes and 1 Egyptian pound) brought me there. At the southern part of the island lies the Aswan museum and the archaeological site. The museum did disappoint, I was expecting something to the level of the Luxor museum but this one is much more simple. It shows lots of small objects that were found on Elephantine island, but only the votive objects I found worth a second look. I did not do well at the rest of the site either: the temperature had risen so high that I had little energy to roam around ruins. I made my way directly to the Nilometer – the third of its kind that I saw on this trip, and the closest one to the Nile itself. ICOMOS had its doubts in 1979 whether such a string of sites a long distance from each other would not set an unwanted precedent: “Does this not invite all countries to define the physical boundaries of their cultural heritage too broadly?” Well – almost 30 years later such loosely coupled WHS have almost become the norm, with the Works of Le Corbusier even stretching continents. In October 2018, I made a day trip from Aswan to visit Abu Simbel, two massive rock temples in Nubia, near Egypt’s southern border with Sudan. The twin temples were carved out of the mountainside more than 3,000 years ago, but eventually became buried by Sahara desert sand and forgotten until 1813, when found by the same Swiss orientalist who discovered Petra just a year before. But it’s Abu Simbel’s recent history that’s mind boggling. In the 1960s, Egypt began constructing the Aswan High Dam to control Nile flooding, provide water for irrigation and generate hydroelectricity, but whose rising waters would submerge the temples. It was decided to relocate the temples to higher ground. So, between 1964 and 1968, the temples were cut into massive blocks, dismantled, lifted and reassembled in a new location 65 meters higher and 200 meters farther from the Nile onto a purpose-built hill. In gratitude, the Egyptian government gifted temples to the main countries that took part in the relocation, which is how the Temple of Dendur came to be on display in the Metropolitan Museum of Art in New York. The Nubian Monuments from Abu Simbel to Philae were the absolute highlight of my trip to Egypt in the fall of 2012. Over fifty years ago, the preservation and movement of these monuments became the first major cultural project undertaken by UNESCO, saving these treasures from submersion under Lake Nasser. Ever since I'd seen pictures of Egypt when I was younger, I'd wanted to see the Temple of Ramses II at Abu Simbel, and even though Egypt Air did its best to complicate my visit by rescheduling my flights, I was not disappointed. The four statues of Ramses II outside the temple were colossal, and inside the temple two rows of slightly smaller statues of Ramses II led to the inner sanctuary. The walls were covered with hieroglyphs, and the temple was remarkably well-preserved; there was little to tell it had been relocated. After flying back to Aswan, I visited the beautiful Philae Temple at night and by day. The temple is on an island, and the approach by water was both memorable and aesthetically pleasing. I loved the hieroglyphs and carvings, like those of pharoah Neos Dionysos (Ptolemy XII) offering sacrifices to Horus and Hathor, which were amazingly detailed. To anyone traveling to Egypt, I highly recommend making time to see these treasures. 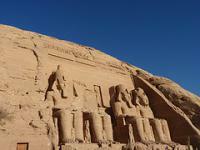 Logistics: When I visited, Abu Simbel was only accessible via a plane flight from Aswan or Cairo. Philae Temple is on an island outside the city of Aswan, and there are several tour operators in the city willing to arrange a visit. I visited this WHS in March 2010. The Temple of Ramses II at Abu Simbel and the Sanctuary of Isis at Philae were saved from the rising waters of the Nile and both are immensely beautiful. Abu Simbel is surely one of Egypt's top WHS. I have been lucky enough to visit Abu Simbel several times, and also managed to time one of these visits to coincide with the sunrise lighting up the statues at the back of the temple. I am as much in awe of the rescue of Abu Simbel as of its original construction. I also visited the monuments on Lake Nasser a few years ago, and plan to return in 2011. The UNESCO campaign of the 1960's impressed me so much that I decided to base my dissertation for my MA in Egyptian Archaeology on the rescued Nubian monuments. I am using them as a case study, to measure to what extent the rescue - but subsequent removal to other countries - has enabled a wider understanding of the original culture. Nubian Monuments: In 1988 I spent 18 days crossing the Nubian Desert of Sudan. Then I took the run down Sudanese barge crossing lake nasser ending in Aswan. The journey was on deck class with about 1000 Sudanese and took 48 hours. Remains of the other Sudanese ferry could be seen. Everyone drowned or were eaten by Nile crocodiles. Along the way was a magical glimpse of Abu Simbel in the distance. It was a timeless and powerful experience. After having enjoyed the life in Cairo for a week - one of the truly most exciting cities in the world - I then took the train from the bustling Ramses station down through the Nile valley heading for Aswan in southern Egypt. Instead of catching a plane, this is a recommendable way to see some of the river landscape and rural Egypt, as the train slowly follows the river, downstream to Luxor and 14 hours later arrives in Aswan. Aswan itself is a lush oasis and virtually the 'last stop' before Sudan and the Nubian deserts takes ove and is itself well worth a stop for a couple of days. A short, early morning flight, then took me the last 300 km down to the famous Ramses-statues in Abu Simbel, moved away from the rising water when the Aswan dam was constructed back in 1972. Once on site, you realise what a majestic project this must have been, almost more impressing than the actual statues themselves. Later the evening, I also visited the temples of Philae, which was also moved away from the rising water and are now located on a small island not too far from the dam itself. Small boats takes you across the water and you can enjoy the beauty of the temple of Isis and Trajans Kiosk, the latter being one of the most photographed temples in Egypt, while having a tea or a drink in the small café. The area between Assuan and the Sudanese border is one of the greatest (and largest) archaeological areas in the world - unfortunately, much of it is located beneath Lake Assuan. However, the greatest temples - Abu Simbel and Philae -, have survived thanks to UNESCO's help and major feats of engineering, as well as smaller sites at islands like Elephantine. Philae is a very interesting and beautiful place, but there are few words to describe the magic of Abu Simbel, the temple built by one of Egypt's greatest rulers, Pharao Ramses II. Seeing the sun rise at Abu Simbel is an unforgettable experience, even after a four-hour busride from Assuan leaving at 3 am. Needless to say, flying is a lot quicker and easier. Assuan itself is a relatively pleasant town with a nice bazaar, a great botanical garden at Kitchener Island, and the Nubian Museum, which I unfortunately missed. The extreme south of Egypt is one of the most interesting parts of the country and must not be missed by any serious traveller. 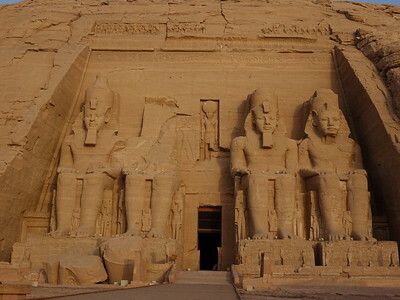 Abu Simbel is just 40 km from the Sudan and 100 km from any decent sized Egyptian city. The best way to visit is to fly there from Luxor or Aswan. Return flights are less than US$80. The temple was completely dismantled and moved to a higher site when the Aswan High Dam was constructed. If that hadn't happened, the site would be 60m underwater right now. That action was UNESCO World Heritage's first big save at an expense of US$40M in the 1960's and 70's. Abu Simbel is massive and is perched high on a cliff at the edge of Lake Nasser. The 4 statues of Ramses II at the entrance are more than 30ft high each. The interior is covered with exceptional carvings and paintings. Philae is at the edge of Aswan also on Lake Nasser. You have to take a quick ferry to get there. This is considered the most beautiful temple in Egypt -- (sort of their Aphrodite). ALthough the structures are less intact that most other Egyptian temples, the island site is beautiful, especially at sunset. Passage of the Sun: Abu Simbel - "The axis of the temple was positioned by the ancient Egyptian architects in such a way that twice a year, on Oct 20 and Feb 20, the rays of the sun would penetrate the sanctuary and illuminate the sculpture on the back wall, except for the statue of Ptah, the god connected with the Underworld, who always remained in the dark. These dates are allegedly the king's birthday and coronation day respectively, but there is no evidence to support this"
Monumental Monoliths: The 'Unfinished Obelisk' at the Stone Quarrries in Aswan. It broke in situ and was never moved. Its weight is estimated at 1200 tonnes. Hittites: Abu Simbel: The inconclusive (?) battle of Kadesh between the forces of Egypt and the Hittites - Ramesses II ("The Great") and Muwatalli II - is represented in bombastic pro-Egyptian terms via a series of carvings in the hypostyle hall (N Wall) "Two Hittite spies are captured and beaten until they reveal the true whereabouts of Muwatalli, the Hittite king. Finally, the two sides engage in battle, the Egyptians charging in neat formation while the Hittites are in confusion, chariots crashing, horses bolting and soldiers falling into the River Orontes. In the text, Ramesses takes on the whole of the Hittite army single-handed, apart from support rendered by [the god] Amun who defends him in battle and finally hands him the victory." Historical Graffiti: "Graffiti inscribed on the southern pair by Greek mercenaries serving Egypt in the 6th century BCE have provided important evidence of the early history of the Greek alphabet". Also Victorian graffiti. Giovanni Belzoni: Feb 1817 - discovered the Great Temple of Abu Simbel and cleared it of sand. 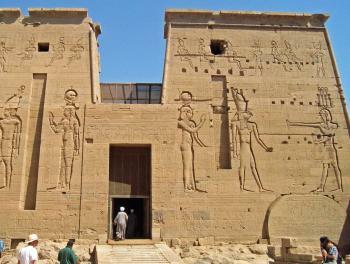 Moved from location of original construction: The Abu Simbel temples and those at Philae relocated to Agilika Island. 180 Community Members have visited.